Adam New-Waterson is the data whisperer. Working at a company like LeanData, he focuses on ensuring that the marketing department’s efforts are actually helping the company and sales team meet their goals in real world applications. Adam and his team don’t settle for just trusting the quality of their efforts; they are constantly measuring their relationship to the rest of the company in a very conscious way. To many, data conjures up images of boring spreadsheets and high school math class, but Adam is putting a new twist on it by using data as inspiration for out-of-the-box content creation. 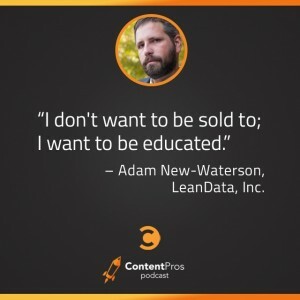 One of the first things Adam did at LeanData was hire a journalist with 35 years of experience as his head content writer. Advocating for the power of educating over selling, he has found incredible measured value by hiring someone who understands both the structure of storytelling and the power of teaching and informing. Christ Moody, everyone. Making childhood dreams come true, one podcast at a time.